Alvin Ailey American Dance Theater's Glenn Allen Sims and Linda Celeste Sims. Photo by Andrew Eccles. In many classical ballets, Broadway shows and contemporary works, there is a love story. Two characters, with passion, find each other, and the dancers tell the tale with such commitment that the audience feels as if their love is real. Sometimes, those dancers take their bow and then go off their separate ways. But other times, the dancers’ love was real, and each day, they enter and leave the theater together, as a couple. In honor of Valentine’s Day, we feature five couples who share not only love for each other but also the common love of dance. And they all just about make our heart melt. Alvin Ailey American Dance Theater’s Linda Celeste Sims and Glenn Allen Sims in David Parsons’ ‘Shining Star’. Photo by Christopher Duggan. Glenn and Linda have spent many of their dancing years together, in the same company and as a couple. They joined Ailey in the late ‘90s and married fairly young – he was 25, and she was 24. And while they acknowledge that no marriage is perfect, they say that open lines of communication and respect for each other’s space have helped keep them together for 20 years. Early on in their relationship, they didn’t dance together often, besides the ballet class they’d sometimes take as a date. But within the past 13 years or so, Glenn and Linda have been partnered mostly with each other. Glenn says his favorite part of being with another dancer is that she understands not only the physical demands of the profession but also the emotional elements involved as well. “She understands what it means to have the opportunity to share our lives on stage in front of many people, and to be vulnerable enough to expose ourselves as human beings,” Glenn explains. Glenn and Linda will spend this Valentine’s Day performing David Parsons’ duet, Shining Star, in Atlanta. 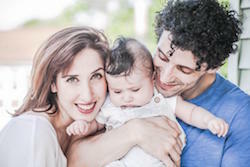 Ekaterine Chubinidze, Lasha Khozashvili and their son, Nicholas Thomas Khozashvili. Photo by Sabi Varga, courtesy of Khozashvili. Not only do Lasha and Ekaterine share a decade-long marriage, but now they also share a one-year-old son, Nicholas. 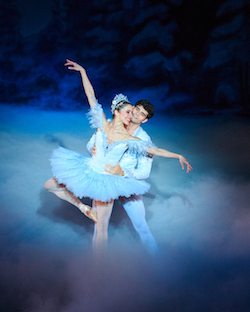 The two dancers often performed together before joining Boston Ballet, and since joining the company, they have been cast as the sensuous Arabian couple in The Nutcracker. Matthew Lawrence and Gaylene Lawrence in rehearsal for ‘Romeo and Juliet’. Photo courtesy of Lawrence. Perhaps Matthew and Gaylene were always destined to meet and fall in love. Both from New Zealand, they were born in the same hospital, in the same month (a year apart) and dedicated much of their life to ballet. And for the past 20-plus years, they’ve spent their life together both in and out of the studio. With a long career – and life – together, Matthew and Gaylene have been able to share every high, low and in-between in each other’s career. “We carry our stories together,” Gaylene says. 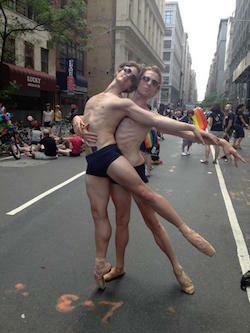 Billy Blanken and J Ryan Carroll at the NYC Pride Parade. Photo courtesy of Blanken. When Billy and J Ryan got together six years ago, they became a package deal. 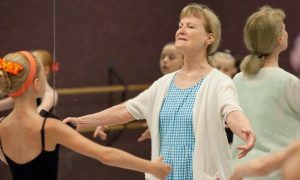 Not only were they spending time as a couple, but they began to travel the globe as dancers and teachers together, and continue to go on tour as teachers. And even though they share these similar interests, they still complement each other with their own uniqueness. J Ryan, for instance, says he’s the one to pack travel essentials that help them save money on the road and have a healthy atmosphere. This Valentine’s Day involves work – Billy will teach and rehearse with his company – but both hope to have a nice, calm evening to enjoy with each other. 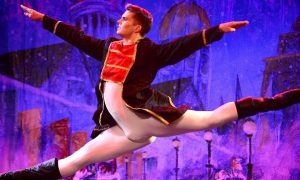 Allison DeBona and Rex Tilton in Ballet West’s ‘The Nutcracker’. Photo by Luke Isley. Perhaps it was just a coincidence that Rex and Allison were both dancers; maybe they would’ve met up even if they didn’t share the same profession. “I married my friend, not a ‘dancer’,” Rex says, after all. And that may be the case this Valentine’s Day, as Rex and Allison will be working, with Ballet West’s production of Cinderella running February 9-25. “We never get to enjoy Valentine’s Day!” Allison says. Danielle Diniz and Daniel Ulbricht. Photo courtesy of Diniz. Despite their different disciplines, adorable couple Daniel and Danielle, who have been dating for over a year-and-a-half, perform together quite often.